Caring for your property piece by piece takes a lot of time and certain tasks can fall through the cracks. Why bother juggling several chores and appointments when you can combine services with Gorilla Property Services. Cleaning off one area while leaving the others clogged or dingy, does not create a well-rounded result for your property. Instead of trapping focus on one area, combining services keeps your property running smoothly and looking great with long-lasting and consistent results. There are certain combinations that just work better than others. In the name of efficiency, our Gorillas have begun pairing services to make a better couple than peanut butter and jelly! 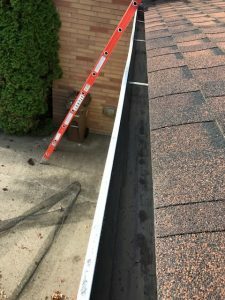 Roof Cleaning & Moss Removal: should always go hand-in-hand with gutter cleaning. These two areas of your residential, strata or commercial properties work together to keep your roof clean and perimeter drains flowing. Graffiti Removal, Pressure Washing, and Soft Washing services: Graffiti vandalism happens and it is important to remove those stains as soon as possible. If you are already cleaning one patch of your space, you might as well do the whole thing! Pressure washing can strip away growth from harder surfaces while soft washing tackles delicate materials. Keeping the exterior of your home or workplace is as easy as calling a Gorilla. While some services are better left for spring and fall months, snow clearing and salting needs are prevalent throughout the winter season. Our Gorillas can create a maintenance schedule that accommodates the needs of your property while creating a safe and inviting environment for visitors and clients. Our Gorillas keep your property going all year long. Creating a customized schedule that fits the needs of your home or workplace is all a part of the expert results at Gorilla Property Services.